Security camera motion blur is never a problem if you have ever watched a crime show on television. The following scene may be familiar: detectives gather around a computer screen, examining blurry security camera footage of their suspect. “Zoom and enhance,” one will say, and after a few clicks of the keyboard, a detailed image of the criminal will come into focus. For anyone familiar with how digital imagery works, this scenario is an obvious work of fiction. In reality, it is impossible to salvage the details of a person’s face if the security camera footage is distorted by motion blur. Business and property owners that fall victim to theft have often felt the frustration that occurs when security camera motion blur fails to capture faces, allowing criminals to evade the justice of the law. A video security system must function reliably and precisely in order to be effective, and low quality equipment with non compliant MPEG video codecs will result in footage that is blurry and unusable. 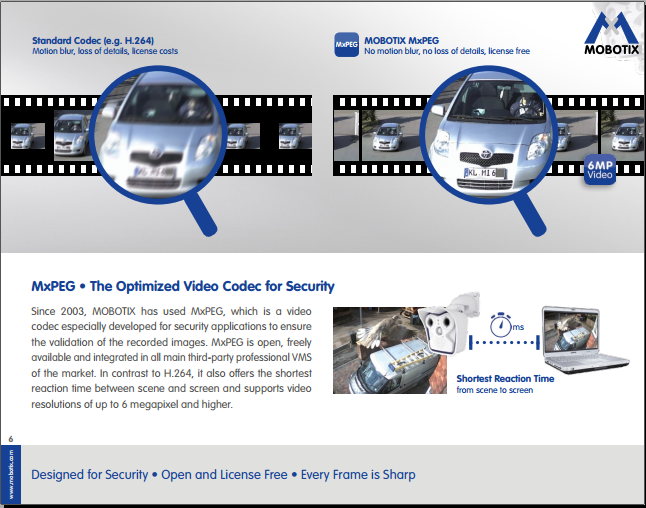 ALL OTHER SECURITY CAMERA SYSTEMS BESIDES MOBOTIX USE MPEG/H264 VIDEO CODECS. MOBOTIX created their own MxPEG codec made specifically for surveillance. In short, MPEG/H264 is for Steven Spielberg and Hollywood, not surveillance or security. Experience the peace of mind that comes with owning a system from MOBOTIX, an industry leader in video security. MOBOTIX security cameras store every single frame of footage in its entirety in an on-board SD card, eliminating the motion blur that occurs when lower-end cameras have to shrink the file size (eliminate detail) using MPEG/H264 codecs in order to send the video to the central DVR efficiently. Since a MOBOTIX camera will record directly to itself using MxPEG, it does not need to shrink the files in order to transport and store them. The new MOBOTIX 6 MP security cameras have had a massive increase in light sensitivity by more than 100-times than the former 3MP cameras. The monochrome version reaches even a 300-times higher sensitivity than the previous series. Instead of one second of exposure time the new 6 MP systems can select only 1/100 s, which results in capturing even fast moving objects in low light conditions. In security every single frame of a video recording has to be as sharp as possible. For moving objects short exposure time is the key. Unfortunately short exposure time of 1/100th of a second grabs 10-times less light than 1/10th of a second. Especially in low light conditions, the lens, the image sensor and the image processing have to be very sophisticated to generate sharp images of the moving object and eliminate security camera motion blur. 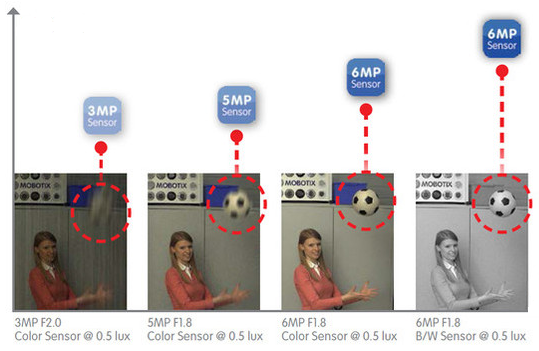 This illustrates how the latest 6 MP sensors from MOBOTIX can capture movement in low light without blurring. This is a 0.5 lux environment which is the same as a dark night with only the moon to light the area. In dark scenes long exposure times of up to one second create bright images and visible static objects. This is perfect to acknowledge objects in darkness. But if objects are moving, long exposure times will create blurring, and make verification nearly impossible. In security applications moving objects are of utmost importance, therefor short exposure times are essential. The short clip above is not in full resolution, but illustrates how MxPEG by MOBOTIX on top saves every frame in its entirety while H264 (bottom) only grabs a full frame every 5 frames. How much detail do you want saved? Security camera motion blur is only a problem if you allow it to be. Arm your home and business locations with a security camera solution that is designed from the ground up to be future proof and feature packed. Capture the detail you need in every frame instead of every 5.